The correct answer, at least for immediate future, is that, according to Reuters, Russell's breakdown has thrown the Kony 2012 "movement" into turmoil and swiveled the spotlight from Uganda and Joseph Kony to Jason Russell, potentially negating whatever awareness the Kony 2012 video initially generated. Robert Thompson, director of the Bleier Center for Television and Popular Culture at Syracuse University, explained that Russell's breakdown has diverted attention from Kony. 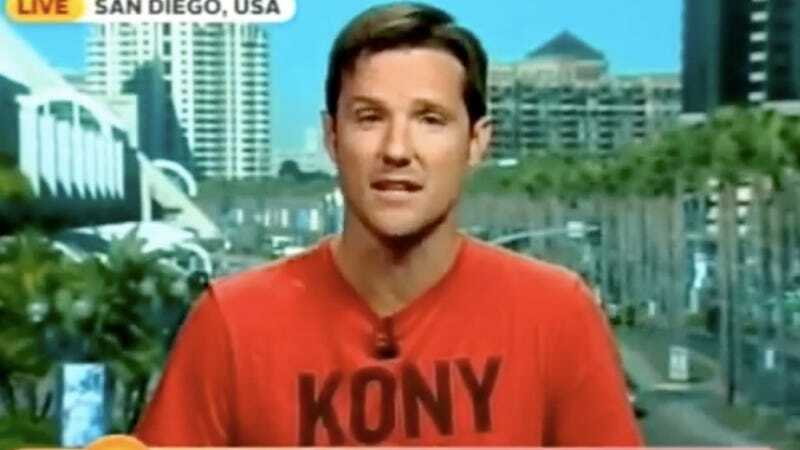 "Now," said Thompson, "whenever you see a Kony story, it's about the guy, not Kony." Meanwhile, Invisible Children co-founders Laren Poole and Bobby Bailey, as well as CEO Ben Keesey, have declined interviews, and in downtown San Diego, the Invisible Children office has been indefinitely locked up (Keesey had attributed Russell's breakdown to the harsh internet jeering Invisible Children received in the wake of the Kony 2012 going viral). A spokesperson for the organization wouldn't say whether it's moving forward with April plans for "20 days of action," during which viewers of the Kony 2012 video were asked to spread awareness in their communities by littering their homes, lawns, public parks, and resident naked, dancing men with posters aimed at making Joseph Kony a household name. Maybe that's happened already. Certainly more people now know the name "Kony" than did before the video's posting and Russell has, in a cruel twist of irony, achieved the fame his lofty goals of founding a New York creative minds academy and bringing down one of the most ruthless war criminals in the world would have garnered for him. Except that Russell's breakdown, because it's more immediately accessible to the popular media — because it's easier to chronicle and arrive with perfect synchronicity at the very moment public scrutiny was increasing on the whole Invisible Children gang — than an elusive Ugandan criminal whose power has faded steadily over the last seven or eight years, has overshadowed the hunt for Kony, turning what was the Jason Russell egomaniacal sideshow into the main attraction.